We specialize in refrigerator repair in Portland OR. There is no problem too big or small for us to handle. From broken touch panels to funny noises, leaks and poor temperature control, we have fixed it all. 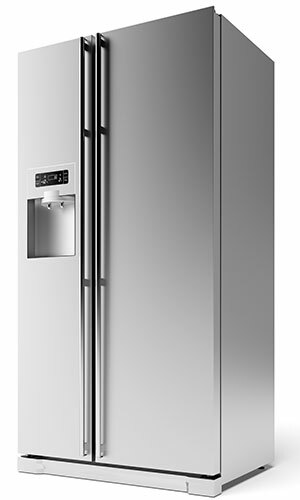 Usually it is a matter of taking out your faulty refrigerator parts and installing new ones. Either way, our repair technicians will make sure that your appliance is brought back to working order. Our company keeps a selection of common refrigerator parts on hand. We have quick access to refrigerator parts in Portland OR as well so you will not be left waiting for the parts you need to be sent in the mail before getting the repair done. A refrigerator repair is usually a quick fix and that’s exactly what it needs to be given the problems that a faulty fridge can cause, so hire a Portland refrigerator repair company that works fast. That’s us. We are available to quickly meet any of your refrigerator repair needs. We just need you to contact us for the initial in-person visit, which will allow our licensed technician to diagnose the problem at your Portland OR home. When we provide our service of refrigerator repair in Portland OR, we try to find the quickest and most affordable solution to any problem. To make it easier, we cut $10 off what we charge for first-time repairs and we don’t bill for the technician’s visit fee if you do decide to have us complete the repair. We are your guaranteed solution for refrigerator problems. We have many years of experience serving the Portland OR area and we would be glad to add you to our list of happy clients. A surprising way to save money on electricity involves simply waiting for food to cool down prior to storing it in your refrigerator. Putting it right into the refrigerator while hot will cause your refrigerator to have to use more power to balance out the temperature change. While a small food item may not seem to generate much heat, a big pot of stew will definitely make a noticeable difference. So, make it a habit to let the food sit out while it cools off.